The pattern includes 2 variations, the graceful cable and pretty crocheted rose, one designed for each of my two small girls, both blessed with their father’s glorious curls. I wanted to knit something that kept their long hair out of their eyes and off of their faces without having to braid or ponytail them every morning. And so Persinette was born. 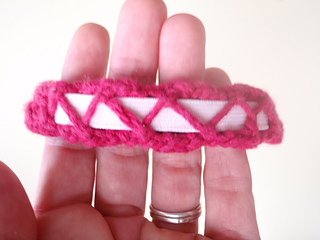 Persinette is a headband. 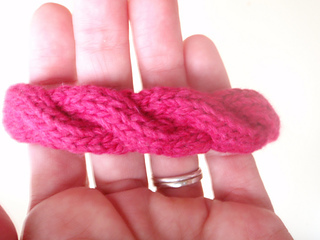 It’s uses a technique to knit i-cord knitted around elastic. The pattern lends itself to creativity and variation. 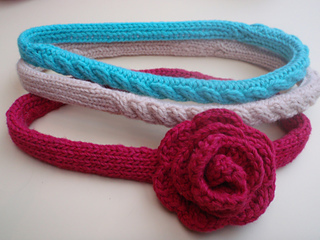 These directions are for a cabled headband and for a simple i-cord band with a crocheted flower. Since you need so little yarn to knit this super quick pattern, you can experiment with ideas, use up leftover yarn or splurge on just a little of something decadent. 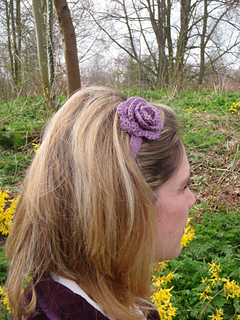 Add buttons or ribbon, a bouquet of crocheted flowers, or create a fairy crown. Let your imagination run free. Persinette is a French fairytale character who would let down her mane of lovely locks to allow her lover to scale her tower prison. 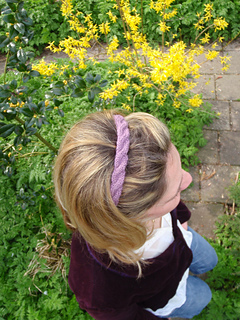 With this lovely accessory, skip the ponytail and let your hair down! Notions You’ll need a 1/2 yard of 3/8” elastic, sewing needle, any color thread (it will be covered by the knitting), a blunt yarn needle, and buttons or beads if you choose.